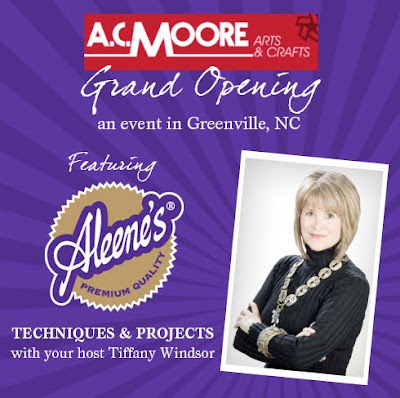 iLoveToCreate Blog: Aleene's Exclusive Store and Online Event with A.C. Moore and Tiffany Windsor! Aleene's Exclusive Store and Online Event with A.C. Moore and Tiffany Windsor! We are excited to announce that Tiffany Windsor will be hosting an in-store event at the new A.C. Moore in Greenville, North Carolina on April 17th! Actually, the Grand Opening celebration lasts for a month starting this Saturday, March 27th! We wanted to tell you about this a few weeks in advance so you can not only plan to attend, but you can get in on the celebration for this store! In anticipation of this event, we will be featuring lots of fun techniques and projects using Aleene's Crafting Adhesives and also more info on Tiffany! So even if you don't live in the Greenville area, you can still get in on the fun! Tiffany will be showcasing super cool techniques that you can do using Aleene's Crafting Adhesives as well as give you an opportunity to do your own Make it Take it! Also, she'll be there to answer all your glue-related and crafting questions! Check back here on our blog, or follow us on Facebook, Twitter, or on Tacky Glue's fan page to get inspired in the weeks to come. We want to show you all the cool things you can do with your favorite bottle of gold glue! Looking forward to my visit to A.C. Moore in Greenville this Saturday 11 am - 2 pm! Come craft with me! See you there!